When I dropped by the supermarket this weekend I noticed that one of the magazines had a familiar Sith Warrior (this one) on the cover. 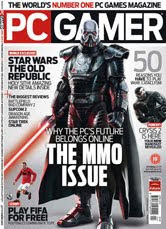 And indeed, what I found was PC Gamer UK’s April 2010 issue, which they’ve labeled “The MMO issue”. And indeed it is, with articles looking at WoW: Cataclysm, a number of future MMOs, rating a number of current MMOs against each other, a free trial for EvE Online on the cover DVD and a number of other articles. But the main article of interest is a six-page article, titled “Tour de Force” looking at Star Wars: The Old Republic. Not that there’s much of any new information in it. Considering when the magazine was published it can’t even cover the presentation given last week during GDC. Though it’s still a nice read. I won’t include scans of the article because I’m sure they’d not be happy with that. But I can briefly walk you through it and highlight what it talks about. The article starts off talking about how you can make story decisions as in previous BioWare games, but this time you can bring friends and discuss the big decisions. The article notes how incredibly huge the game is, including a quote from James Olhen on how they’re “creating more content than Mass Effect 2, Mass Effect 1, Dragon Age, and Knights of the Old Republic put together, and throw in Baldur’s Gate too.” It also mentions how it has more dialog already than both Mass Effect games put together, and how when it’s done it’ll have more recorded dialog than all their (17, including expansions) games combined. As the article goes on to explain one should probably see it more like your traditional WoW-style MMO, except that instead of boring text boxes with quest descriptions you get Mass Effect 2-style cinematic conversations. In fact, ME2’s lead cinematic designer Armando Troisi is on the ToR team now. The article goes on a bit more about the cinematics and story telling, noting how every class has its own story. Olhen compares it to Dragon Age’s origin stories, only going all the way through the game. It also talks about how you can recruit NPCs to fight by your side (though it doesn’t mention that you can only take one of them with you at a time). You’ll be introduced to one early in the game, but will meet others you can recruit later on. These companions have their own personal stories which, because the companions are unique to your class, can tie in to your class’ story as well. It then talks about how your class determines your story, your voice, your companions and your abilities, but that you get choice further down the line in your abilities. At oen point you can evolve into one of two more specialized classes. The example given is for the Sith Inquisitor; either a Darth Maul path with the dual-bladed lightsaber or the Emperor Palpatine path concentrating more on Force powers. A sidebar also mentions the choices for a Jedi Knight; either a tougher heavy armor warrior or a damage dealer with two lightsabers. it talks a bit about the combat and how it’s pretty much just “whittling people’s hitpoints down — like most MMOGs, but unlike other BioWare games”. it points to the developer walkthrough video to let you judge for yourself. It talks about how fighting and questing is going to be 90% of the gameplay, and how BiOWare isn’t commenting much on the other 10%, though they note that it includes open world PvP, more structured PvP, crafting and endgame. The last one is said to include classic systems, but also something brand new “that hasn’t been done in an MMO before“. They still want you to be questing at endgame though as they don’t want it to be completely different from what you’ve been doing. The article concludes with how they’re hoping for an MMO that doesn’t ape WoW, and that The Old Republic might just be it. There’s also a sidebar on voice acting, with a picture of Jennifer Hale (who voiced Bastila in KotOR and female Shepard in the Mass Effect games). In The Old Republic she’ll apparently be playing a Republic Trooper (and it doesn’t say whether that’s an NPC or whether she’ll do the voice for the player character). The sidebar also notes how they’ve pretty much tapped out Hollywood and how they’ve got voice talent from England as the Imperials all have to have a British accent. And that’s pretty much it. The only thing I glossed over a bit is the opening paragraph. Not that it includes any details at all, but I just though that it was hilarious. I hope that PC Gamer doesn’t mind me sharing that bit with you; enjoy. You remember the scene: Luke severs Darth Vader’s hand in a stroke of poetic justice, but pauses before the kill. He could rid the galaxy of a villain, or give his dad a chance at redemption. He hesitates. The emperor cackles. He hesitates. Vader looks around nervously. He hesitates. A crowd of stormtroopers gather, shuffling uncertainly. He hesitates. His eyes glaze over. Somewhere behind the scenes, Harrison Ford is tapping away furiously to Mark Hamill. * Mark Hamill has disconnected. Thanks Tom Francis for writing that.